Anthelmintics Tablets are one of the widely used and appreciated anti-parasitic medicines which are used for the treatment of patients suffering with tapeworms or other worms in their intestinal passages. These Anthelmintics Tablets are of several kinds including Albendazole 400 mg Ivermectin 6 mg, Albenmet Susp and Albendazole Tablets 400 mg. 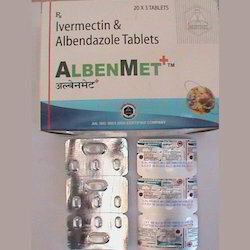 Composition: Albendazole 400 mg Ivermectin 6 mg.